What does IKEA mean in Companies & Firms? This page is about the meanings of the acronym/abbreviation/shorthand IKEA in the Business field in general and in the Companies & Firms terminology in particular. An international, originally Swedish home products retailer that sells modern, utilitarian design furniture, much of which is assembled by the consumer. 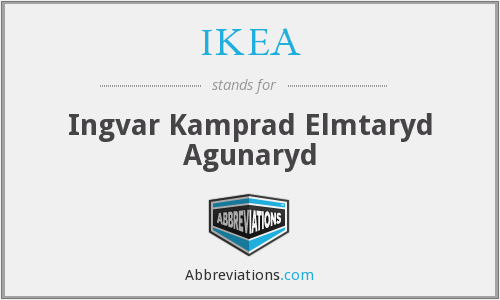 How popular is IKEA among other acronyms? "IKEA." Abbreviations.com. STANDS4 LLC, 2019. Web. 18 Apr. 2019. <https://www.abbreviations.com/term/257156>.